Can a front door direction create bad feng shui in the house? If you discover that your house's front door is facing your worst feng shui direction, you probably want to know if there are any feng shui cures to improve the situation. There are some basic cures specifically for the front door, but before you get to those, first consider this question: Does the house have such good feng shui energy that the only thing left to deal with is the unlucky direction of the front door? If not, you should start by focusing on the basic work to bring balance and vibrant energy to your home, then turn your attention to the unlucky feng shui direction of the door. Unfortunately, a lot of feng shui information on lucky and unlucky directions can be very distracting and thus misused. Yes, it is good to face your best directions because theoretically, this is where the best quality of energy for your type is coming from. However, lucky direction is just one of the many guidelines for creating good feng shui in your home; for creating a home that works for you and supports your health and well-being. Also, direction alone does not necessarily ensure good feng shui. For example, what if facing your best feng shui direction means facing a corner, or a view of the dumpster in the back street? Would that still be good energy for you? Practicing good feng shui is often similar to creating art or music. You start by learning the feng shui basics very well, and then you improvise based on what you have to work with. There are no rigid rules because there are no two identical homes or spaces or even people. Feng shui is all about creating good spaces where people can thrive. With this in mind, check the feng shui of your whole house, especially the areas that are often neglected, such as the closets, the basement, the garage, or the laundry room. Is there anything that can be improved? Also look at the more conspicuous and commonly used spaces, the bedroom, the kitchen, the bathroom, and the main entrance? Focus on paying loving attention to each and every area of your home and applying all appropriate feng shui tips, then you can turn your attention to the challenging issue of unlucky feng shui directions. Before addressing specific cures for a front door that faces an unlucky direction, first be sure your front door is really well taken care of so that the Chi, or energy, can flow in easily and that overall you have a strong feng shui front door. Part of this is making sure the feng shui decor is nourishing for the bagua area of the door. 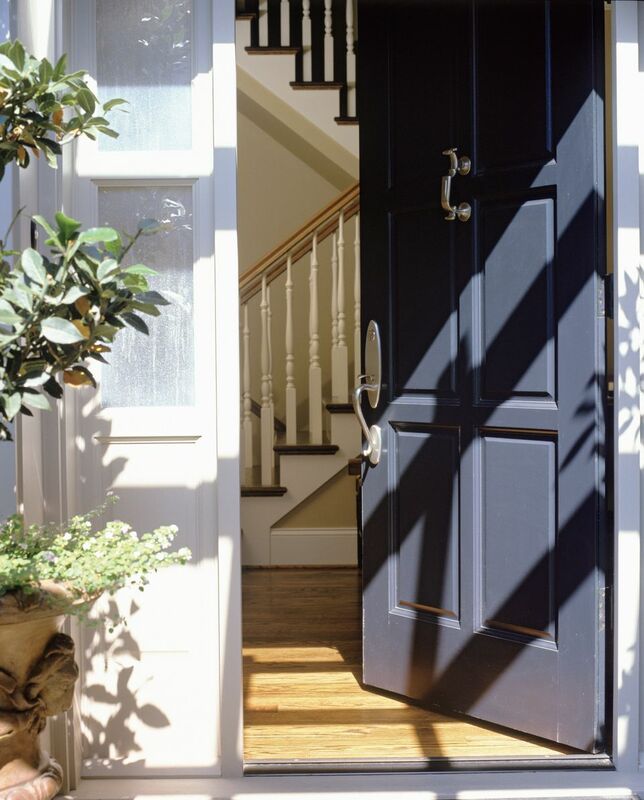 For example, if you have a south-facing door, you want to avoid a blue front door color or a black doormat. Overall, you need to "protect your luck," so to speak, because unlike the good directions that strengthen your luck, bad directions tend to challenge your luck. There are three traditional methods or approaches to dealing with an unfavorable front door direction. The first is to minimize the use of the front door by designating another door for everyday traffic. Often this is an easy change, or it may already be your habit. Many people enter their house either through the garage or through the back door, so the front door is left with mostly a symbolic meaning. If your front door with an unlucky feng shui direction is used less often, the negative energies will not be triggered or activated. Second, do your best to create strong protective energy around your front door. You do not need to go as far as hanging a bagua mirror, but you might want to work with any other appropriate items that bring strong protective feng shui energy to your front door and your main entry. Some traditional feng shui cures are the sculpture or image of Quan Yin, the goddess of mercy and compassion, or the presence of the Kuan Kung, the god of War. You can choose your own symbols that bring the energy of protection and mercy. Third, you can use cures that weaken the feng shui element of the unlucky direction the door faces. For example, if your front door is facing North—and North is an unlucky direction for you—you can weaken the Water feng shui element of the North by using feng shui decor features of the Earth element. However, this must be done in a very subtle way because you still want this bagua area to work for you so that the career energy connected to the North area flows harmoniously. No matter which cures you choose, always remember that you are the one who makes your own luck. Deal with what has to be dealt with, but do not give an unlucky direction too much power and do not live in fear because of it. Feng Shui: What Direction Does Your House Face? How Does a Staircase Affect Feng Shui?